Home › News › The Accademia Bizantina closes its European tour in Barcelona with "Marc'Antonio e Cleopatra"
The Accademia Bizantina closes its European tour in Barcelona with "Marc'Antonio e Cleopatra"
The next sunday 11 of November, the Byzantine Academy, directed by famous harpsichordist Ottavio Dantone, presents in Barcelona "Marc'Antonio e Cleopatra", serenade for two voices German composer Johann Adolph Hasse, with libreto of Francesco Ricciardi, released in 1725 Naples famous castrato Farinelli with as Cleopatra and contralto Vittoria Tesi as Marc'Antonio. L 'Auditori de Barcelona will host the final round of the European tour of the Accademia Bizantina, after passing through prominent concert halls such as the Kölner Philharmonie or Laeiszhalle Hamburg. 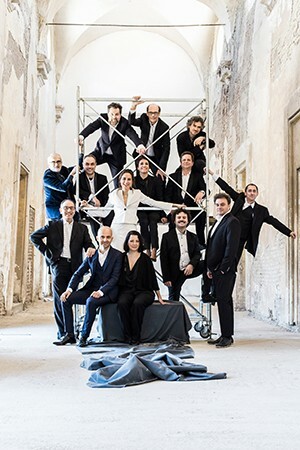 the prestigious ensemble, founded in the Italian city of Ravenna in 1983, It will for the occasion with a duo of singers expert in the interpretation of affections baroque, very present in this work about the loves of Egyptian queen: contralto francesa Delphine Galou (Marc'Antonio), and the Austrian mezzo Sophie Rennert (Cleopatra). Among the most immediate projects of Accademia Bizantina Ottavio Dantone and its director, highlight the new production of the opera "Rinaldo" and "Serse" Haendel, that soon they will present in prominent theaters in Lombardy and Emilia Romagna, and his American tour with violinist Giuliano Carmignola. further, he 16 November will market his latest album project for the legendary collection The Vivaldi Edition, French label Naïve Classique: the opera "Il Giustino" de Vivaldi, with the voices of Delphine Galou (Giustino), silk Thread (Anastasio) and Emöke Barath (Arianna), among other.